Shaq Attaq OG 25th Anniversary Edition on sale for UNDER $100!!! The original Shaq signature model from 1992, brought back from the archives by Reebok for its 25th anniversary. Iconic basketball sneaker offers a leather + mesh upper with a molded lace-front closure, featuring Pump tech for a customized fit and an injection-molded midsole for maximum cushioning. Finished with a removable sock liner and a herringbone-textured outsole for grippy traction + durability. 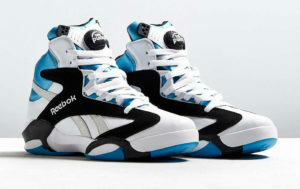 Innovators from the get go, Reebok continues to release modern must-haves and classic reissues.